Sabor Divino and its family of restaurants is a local success story. Sabor is known as one of the top seafood establishments in the city, while Urbano Pizza helped usher in the wave of quick-serve, thin-crust pizza parlours in Edmonton. Bodega, on the other hand, occupies a unique position with its authentic approach to Spanish tapas, allowing diners an accessible way to traverse the globe for Mediterranean flavours. It’s a successful formula that has translated into a need to expand the original location on the Boardwalk downtown, spawned a cozy second location in Highlands, and later this year, will add a third just off 124 Street in the former Dish and the Runaway Spoon space. That said, each Bodega branch will offer something slightly different; for instance, we were told that the 124 Street location will be open for lunch. The Highlands location on the other hand, serves what they term "Spanish brunch" every Saturday and Sunday from 11am-2pm. The menu carries over some of their tapas-style dishes, but features other, egg-based dishes to tempt the palate of weekend brunch seekers. The dishes are variations of familiar dishes, but with a Spanish or Portuguese twist – a Spanish potato omelette, baked eggs with chorizo and Serrano ham, and a breakfast sandwich topped with the chef’s special sauce, a unique recipe every Portuguese restaurant has on its roster, or so we were told. My friend May and I met up at Bodega Highlands for brunch on Saturday. There were only a handful of other tables during our stay, which was a bit surprising given the usual brunch hustle in Edmonton. 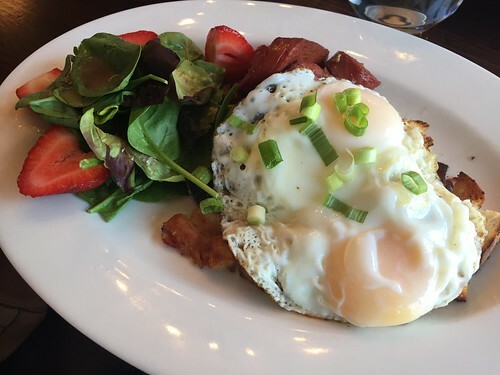 Our server indicated that it’s typically busier on Sundays, but we also had to wonder whether their brunch program is still relatively under the radar. I ended up ordering the migas con huevos ($15), sautéed bread crumble and bacon with two fried eggs and beef sausage. 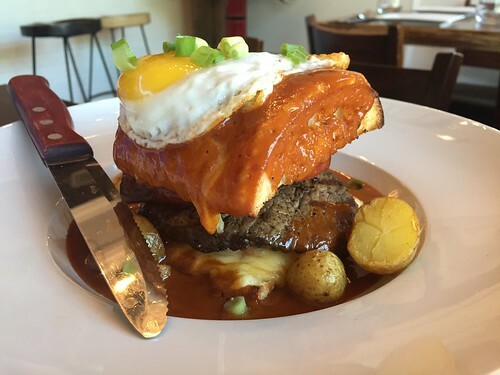 May selected the Francesinha ($18), a Portuguese baked sandwich with Edam, sausage, ham, beef tenderloin, chorizo, fried egg, and the aforementioned special sauce – definitely not a dish for the faint of heart. 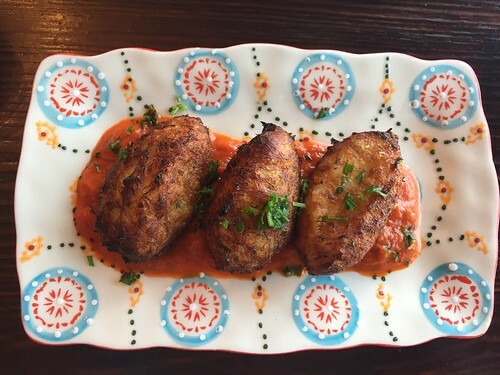 We also decided to share the salt cod fritters ($9) to start. Given the quiet state of the dining room, we received our dishes relatively quickly. The fritters were nice and light, though probably would have paired better with a glass of wine or beer as opposed to coffee. Our mains were generous; a side salad wasn’t mentioned on the menu but I appreciated the pop of freshness on the plate. The mixture of toasted bread, bacon, and eggs was satisfying, but it was the well-seasoned beef sausage that was the star of the dish. My only quibble was I had to send my eggs back once to have them cooked to the requested doneness; unfortunately, even after that they were still not right. May really enjoyed her sandwich, a meat eater’s dream. The sauce soaked right through the bread, and provided a nice accompaniment to the different layers of meat. Service was attentive throughout, and refills of water and tea were plentiful. It may have been different with a busier room, but we were satisfied with the experience overall. Afterwards, we walked off brunch with a stroll through the neighbourhood – Bodega works well as a starting point to explore Highlands, if you don’t frequent it often (as is the case for me). We checked out the elegant MacGrath Mansion, then popped into some of the shops on 112 Avenue, including Mandolin Books, Majesty and Friends, and Be-a-Bella. 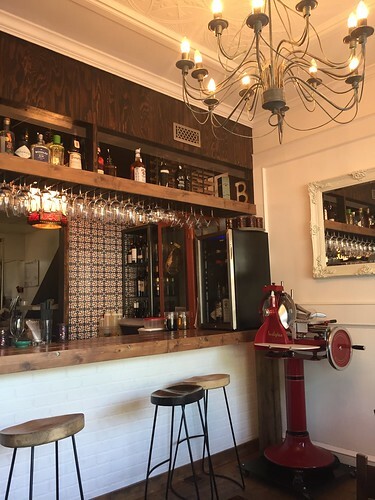 If you’re looking for something different to change up your weekend brunch routine, I’d suggest giving Bodega Highlands a try.